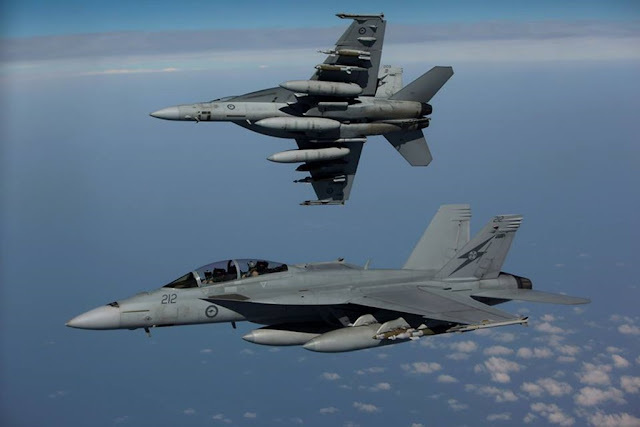 Australia’s six F/A-18F Super Hornets will back home during January 2018 marking the end of Australia’s air strike operations in Iraq and Syria. Australia’s six F/A-18F Super Hornets end air strike operations in Iraq and Syria. Minister for Defence, Senator the Hon Marise Payne, said Australia had reviewed its contribution with its Iraqi and Coalition partners following the announcement of Iraq’s liberation from Daesh by Prime Minister of Iraq Haider al-Abadi. “The battlefield success against Daesh means our own Operation OKRA has now reached a natural transition point and our strike aircraft will begin returning home early in the New Year,” Minister Payne said. The strike aircraft deployed as part of the Air Task Group conducted more than 2,700 sorties against Daesh targets in both Iraq and eastern Syria. Australia’s E-7A Wedgetail and KC-30A refuelling aircraft will continue to support counter-Daesh coalition operations. Australia will also continue its training mission, which involves around 300 personnel at Task Group Taji and around 80 personnel in a Special Operations Task Group. “Australia is committed to supporting the Iraqi Security Forces as it clears the remaining pockets of Daesh fighters in rural areas and ensuring the long-term stability of Iraq,” Minister Payne said.